I love everything about making websites – I enjoy making videos, graphic design and SEO. It combines art and science and you can see the results instantly. I make sure all my customers are happy – here is what some of them have to say! Maxie wrote this on the DCP Facebook page which was really sweet. The lion I am playing with was 8.5 months old at the time. We were very lucky because, from 9 months, they are deemed too dangerous to interact with and we would not have been allowed in. Only staff and their carers were allowed in their enclosure. This lion (Chuck or Norris, I can’t tell!) 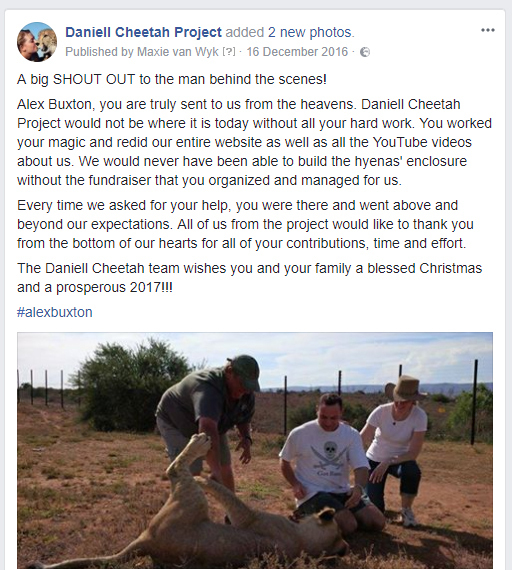 was rescued with his brother from the terrible canned hunting industry. They will now live their lives out in safety as Ambassadors Against Canned Hunting.